SIDNEY, British Columbia, Canada, May 2, 2011 (ENS) – Green Party Leader Elizabeth May tonight became the first Green MP elected to the House of Commons since the party was founded in 1983. Conservative Cabinet Minister Gary Lunn, who had won five straight elections and represented the Saanich-Gulf Islands riding for the last 14 years, lost his seat in the historic upset. Lunn was minister of state for sport and the minister in charge of the 2010 Vancouver Olympic Winter Games in the Cabinet of Prime Minister Stephen Harper, who lost a vote of confidence in March, triggering the general election. Across the country Conservatives won a solid majority Monday night after five years of minority government. For the first time in history, the New Democratic Party will form the Official Opposition after voters gave the left-leaning party 102 seats. The Liberal Party lost big-time and won just 34 seats, and The Bloc Quebecois, the French separatist party which ruled Quebec politics for two decades, lost so badly that it no longer even qualifies for official party status. “This is definitely going to be a much more aggressive and unrestrained government,” said May at her victory party in Sidney, where a joyous celebration erupted among her supporters when Lunn conceded defeat. Her victory came at the expense of the Liberal vote in the Saanich-Gulf Islands riding, which appeared to shift almost entirely to the Green Party. “We need hope over fear, compassion over competition,” May told the cheering crowd of her supporters. It was May’s third try at winning a seat for herself and the Green Party. 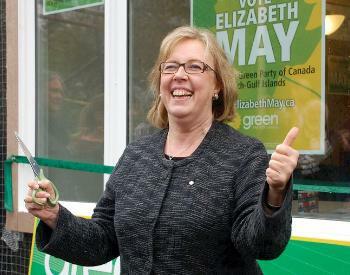 An environmental attorney, May moved west in 2009 after trying to win a seat in Nova Scotia in 2008 and Ontario in 2006. May was not permitted to join the leaders’ debate because the Green Party had no seat in Parliament, but supporters crowded into the Saanich-Gulf Islands riding and their work won May the party’s first-ever seat. In the 2008 election, May was allowed into the leaders’ debate. It happened because MP Blair Wilson joined the Green Party after being rejected by the Liberal caucus, giving the Greens a seat in Parliament. But never before has a candidate been elected on the Green ticket.